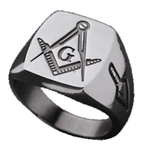 Masonic Ring 8mm Tungsten band ring with Masonic symbols. 8mm Tungsten Carbide band ring. 2mm thickness. The finish is highly resistant to scratches and scuffs, holding its mirror-like shine for years. Engraved Masonic symbol on front of bandBe sure of your size. You may print our ring sizer. Please be aware of the knuckle.